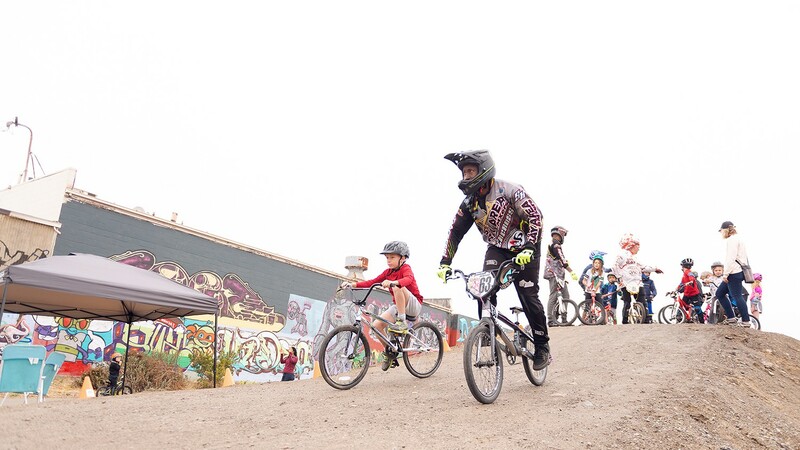 Kids can ride for free at Dirt World 365 days a year. On a cool, breezy summer day at the corner of 20th and Ohio streets in Richmond, Jasmin Malabed and Dennis "D2" Hoskins were watching several helmeted little kids zipping up and over big mounds of dirt. But these were not just any old mounds of dirt. These were part of Dirt World, a new BMX bike park that will officially debut Saturday, Sept. 1, with a two-rider BMX practice track, four jump lines, a dirt quarter-pipe, and a pump track. Malabed and Hoskins moved to Richmond seven years ago and live around the corner from Dirt World with their children. They first created the Dope Sauce Bike Club in August 2015 because they wanted neighborhood kids to be able to ride bikes in safety. “We chose the name ‘Dope Sauce’ because the Urban Dictionary definition reads: ‘One who is dope sauce slides with ease through daily problems,’” Malabed said. Later that year, they were instrumental in helping build the small pump bike track, which contains dirt berms to change directions and dirt "rollers" to "pump" bikes over, at Richmond's John F. Kennedy Park. Then, while riding back and forth to their kids' school, they spotted a site on the Richmond Greenway, a three-mile-long former Santa Fe Railway corridor that is slowly being transformed into a string of parks and gardens. The 2.1-acre city-owned lot was overgrown with weeds and covered in trash. What Hoskins and Malabed saw, though, was the potential for a bike park unlike any in Richmond or neighboring cities. "Kids and families had to go to Napa or Pleasanton, places like that," said Malabed. "Over the years, people have created their own little dirt parks in Richmond, but they weren't legal and always got bulldozed." So, using contacts made from their experience with the pump track, which included the Trust for Public Lands, nonprofit Rich City Rides, and Action Sports Construction, plans for Dirt World emerged. Other supporters included Groundwork Richmond, Friends of the Richmond Greenway, The Watershed Project, and the Bicycle Trails Council of the East Bay, alongside a bevy of local businesses and community service clubs. The couple recruited support from within city government, which eventually resulted in Richmond donating the land as a new city park. Landscape architect Jeanine Strickland volunteered her expertise. People such as Howard Cato from Bay Area BMXers joined the steering committee, and Richmond Friends of Recreation became a fiscal sponsor. That allowed Dirt World to be eligible for a Richmond Environment and Community Investment Agreement (ECIA) grant to help fund the build. Street and dirt riders from Richmond BMX provided sweat equity in clearing and cleaning the lot as well as constructing the track. "The bike community is so big in the Bay Area, and they were completely supportive in bringing something together," Malabed said. "Here in this neighborhood, people want to see positive change and positive things for kids." Of course there were doubters. "We've had people throw shade on the location. But most people have been very supportive," she said. The project's backbone, however, remained Hoskins and Malabed, and they admit they had to "put 100 percent into it." On July 13, Dirt World soft opened to the public as a free facility. On that same day, a post on the park's Facebook page revealed a locally famous BMX freestyle rider had already discovered the track. "Rumor has it Jason Lopez 360ed each jump on the big line last night (and threw a 360 tailwhip on the last hit)," the post stated. The park is open sunrise to sunset, 365 days a year. Helmets are required for riders, and since Dirt World currently has no paid staff, parents must be responsible for the safety of their kids while riding. Hoskins and Malabed are still seeking kid-size BMX bikes in good working order that can be used for free by those who don't have bikes. (Hoskins notes that he often sees kids come in who have outgrown their bikes and don't realize it.) They also accept helmets and are seeking a full-scale first-aid kit. "We have patched up quite a few elbows," said Malabed. Since the city of Richmond has not yet been able to install water fountains, Dirt World also needs a way to supply water without using plastic bottles. Yet the Dirt World dream extends beyond what's been created so far. Malabed and Hoskins envision being able to hold BMX competitions, "maybe even create an X-Games site," said Hoskins. "We would like to install a huge video screen on the building wall adjacent to the park, so that people can see the riders up close." Other ideas include day camps, after-school activities, building classes, a seminar in action sports video production and photography, and part-time jobs for Richmond youth, who could work as coaches, teachers, and park monitors. Hoskins, Malabed, and their small army of volunteers are preparing for the grand opening on Sept. 1, from 10 a.m. to sundown, which will feature music, food, games, and a bike raffle. For now, though, Dirt World is already a success. Even the approach of the rainy season has benefits, as the track will be treated with a polymer-based soil stabilizer that will harden and solidify the tracks and jumps.